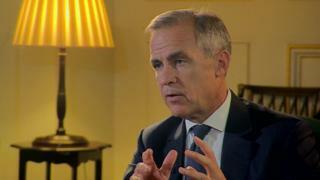 The Bank of England’s governor has warned the cabinet that a chaotic no-deal Brexit could crash house prices and send another financial shock through the economy. Mark Carney met senior ministers on Thursday to discuss the risks of a disorderly exit from the EU. His worst-case scenario was that house prices could fall as much as 35% over three years, a source told the BBC. The warning echoes some of the Bank’s previous comments. The Bank of England routinely carries out “stress tests” to check whether the banking system can withstand extreme financial shocks. Its latest one was conducted in November, when it said a 33% fall in house prices could occur in a worst-case scenario. Several reports said that the Bank governor also told the Downing Street meeting that mortgage rates could spiral, the pound and inflation could fall, and countless homeowners could be left in negative equity. Speaking on Friday in Dublin, Mr Carney said the stress test was aimed at making sure the the largest UK banks could continue to meet the needs of the country through “even through a disorderly Brexit, however unlikely that may be”. “Our job, after all, is not to hope for the best but to plan for the worst,” he added. Mr Carney, who has just agreed to stay on as governor of the central bank until 2020, has faced strong criticism in the past, with Brexiteers accusing him of being part of the Remain camp. It appears that the Governor wasn’t providing the Cabinet with a forecast of what the Bank believes would happen in the event of a no deal Brexit. He was briefing the Cabinet on what preparations the Bank was making if that does happen, including last November’s stress test. It was not a forecast. It was an apocalyptic test where the Bank deliberately sets the parameters beyond what might reasonably be expected to occur. The major banks all passed the test, giving reassurance that the financial system can cope with whatever happens next year. The Governor believes that a “no deal” scenario would be bad for the economy. But not as bad as the headlines today which are based on a doomsday scenario that is not actually forecast to happen. In August, Mr Carney told the BBC that the risk of a no-deal Brexit was “uncomfortably high”. That comment prompted leading Tory eurosceptic Jacob Rees-Mogg to call Mr Carney “the high priest of Project Fear”, while former minister Iain Duncan Smith said “there is no such thing as a no-deal” and the Bank “struggled to understand how this would work”. But he warned house prices were likely to fall in the first half of the 2019 as people put off buying amid the Brexit uncertainty, while the number of sellers, “driven by death, debt and divorce” would remain about the same. Following the Downing Street meeting, the Prime Minister’s official spokesman said ministers remained confident of a Brexit deal, but had agreed to “ramp up” their no-deal planning. “As a responsible government, we need to plan for every eventuality. The Cabinet agreed that no-deal remains an unlikely but possible scenario in six months’ time,” the spokesman said. The Bank of England declined to comment. The cabinet meeting was part of a series of no-deal planning sessions designed to discuss the “unlikely” scenario that the UK leaves the EU without an agreement in place. After each meeting, planning papers are published on various subjects. On Thursday, the papers disclosed that UK car drivers may have to get an international driving permit if they want to drive in some European countries after a no-deal Brexit. The government said that after March 2019 “your driving licence may no longer be valid by itself” in the EU, in its latest no-deal planning papers. The papers also warned that Britons travelling to the EU may need to make sure their passports have six months left to run. And, in an interview with BBC Political Editor Laura Kuenssberg, Brexit Secretary Dominic Raab said the government was trying to give the “reassurance that consumers need” on the issue of mobile phone roaming charges but admitted that European operators could pass on charges.